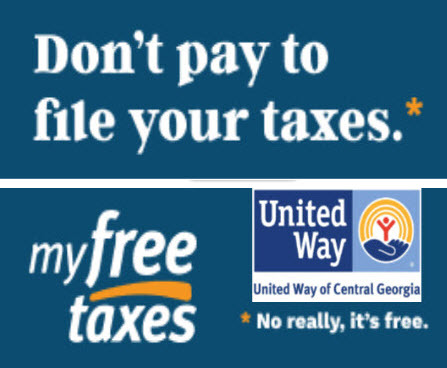 As the start of tax filing season begins January 23rd, the United Way of Central Georgia wants all those filers making $66,000 or less to take advantage of free tax services using MyFreeTaxes.com. For the past nine years, United Way has partnered with H&R Block to provide free tax filing services for federal and state taxes in all 50 states and the District of Columbia. Since that time, the partnership has helped nearly a million people file returns, bringing more than $1 billion in refunds back to communities. “We don’t want to stop there,” said George McCanless, president/CEO of United Way of Central Georgia. “Estimates are that more than $3 million in earned income tax credits go unclaimed in Bibb County alone. With MyFreeTaxes, filers can make sure they get all the credits and deductions due them. They’ll also get support from IRS-certified specialists that reduces the time it takes to complete their returns. The service takes about an hour to finish and provides a way to upload a W-2 and use it to fill in information; access unlimited assistance via 1-855-MY-TX-HELP; and see real-time updates on how refund amounts change over the process. About 70 percent of taxpayers in the U.S. qualify for MyFreeTaxes. This is the only free, online tax filing system powered by a nonprofit organization.